I have shared this before but its well worth shareing again , have your temps done a noticible increase,if so this is a must try. 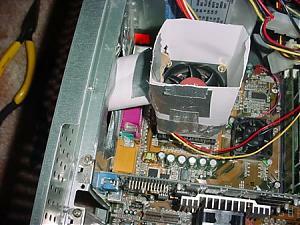 I do this about 1 time a month, and it does help ,especially if you live in a dusty area like me.First ,goto Walmart or just about any store with an electronics department and buy you a can of compressed air , should run around 5.00 American.Next , come home ,take apart your computer and blow out every fan in your system includeing the HS and the power supply , I did this yesturday and it dropped my full load temps 4-5 C , not too bad , see the dust acts like a insulator on your HS and power supply ,so if you think about it , then it makes sense.I now have a full load temp of 47C, just thought I would give anyone who didnt know this tip . 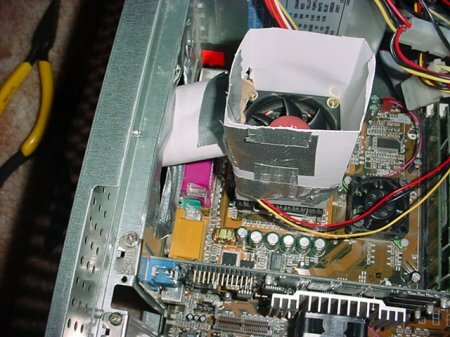 This is not only a good cooling tip, but also a good computer maintence tip (not to mention great for those of us who have dust allergies). Also, keeping your comp dust free helps it stay cooler by allowing the fans to work at maximum capacity. And I'm sure that a few computer components have shorted out due to too much cat hair/dust/dirt on them. Finally clean cases look nicer. With all the dust in my home, this is a monthly affair. Thank God I have an air-compressor in my garage to take care of it . . . .
Canned "air" is ridiculously expensive if you get it at the wrong place. $12, for a can that's smaller than the one's I paid $3.33 each for at Costco. It's a bad impulse purchase, most of the time! I live in a dusty area. There are no salt pans or alkali flats anywhere near Seattle. All the same this is a very dusty city, especially as the ground is wet at least half of the year! Filters on my 120mm intakes are a must. Not an option. Even so, a spritz of canned air in the trouble spots every month is a good idea. When I first installed 120mm intakes on my two boxes, I figured that dust wouldn't be much of a problem. Six weeks of 24/7 with no intake filter.... Dust like Spanish Moss hung eerily and yuckustingly all over the place. It waved in the breeze. It was yugly, no lie! Just sprizting it off won't fix the problem, that just puts the dust back into circulation. Get a really good vacuum (the Filter Queen is top of the heap. I've seen it vacuum smoke out of the air, and hold it all), and blow the dust off to free it up, then vacuum the stuff out. Sure, you'll get more again later, but at least you'll be starting with a clean box. it usually scatters dust all over the place when I do my HSF and Power supply. it never ceased to amaze me how dusty alaska is. That is a good tip. I find it more convenient to use fan filters with foam elements. Pop the grills off and a quick rinse in the sink is all that's needed. I live in a dusty agricultural area. Filters are essential. Last edited by Colin; 2nd October, 2001 at 05:48 PM. I can do the same thing when I smoke. Just take a hit and hold it for about 40 seconds. I'd show ya' but that's kinda hard to do without a webcam . . . .
Are you sure it isn’t harder to kill 1 bird with 2 stones?